Blast to the future using all the Power Rider 360 – the all-new, electrical powered three-wheeler out of Razor. With the push of a button, you are off – without any pedaling required. Hurry at rates up to 9 mph, cut total 360 level spins, slip, even float on Power Rider 360’s high heeled duel inclined back caster wheels. Features a chain-driven motor, together with push button around 40 minutes of constant usage, front, hand controlled steering, welded steel framework with moto-style double crown fork layout, hi-impact front wheel, rear, double inclined casters for drifting along with turning activity, rubberized grips and folding foot pegs. Additionally includes, a12V sealed lead acid rechargeable battery system with charger. 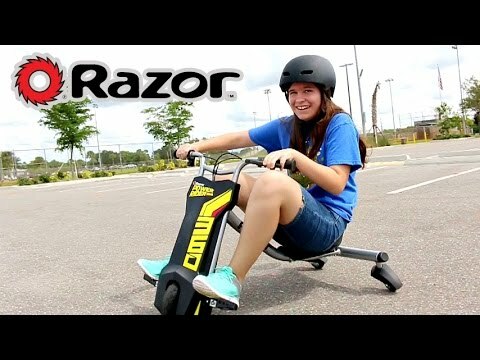 Recommended for ages 8 and older and will encourage up a rider to 120 pounds.) The purchaser and riders of this Power Rider 360 are responsible for understanding and obeying all local, federal and state regulations regarding the riding and use of Razor electrical vehicles and scooters. Blast to the future together with the PowerRider 360 – all-new, electrical powered 3-wheeler out of Razor!